National Safety Month is a reminder how to help prevent unnecessary injuries and deaths at work, on the roads, and in our homes and communities. Older drivers at work tend to practice better driving habits, but they are at a higher risk of injury or death if involved in a crash. 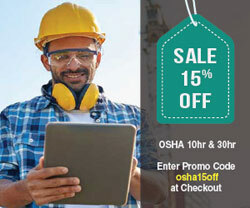 The OSHA Outreach 10 Hour Training Course provides instruction on OSHA regulations and requirements as they apply to 29 CFR 1926 (Construction). This course provides an entry level construction worker with a general awareness to recognizing and preventing hazards on a construction site. The total number of construction worker deaths have steadily increased the past few years. A very small number of construction deaths are the result of true accidents. New York City Council passed a new safety bill on how construction illnesses and deaths are reported and what new safety procedures must be adhered to under penalty of fines up to $25,000. By 2020, American workers 55 years or older will increase by almost 10 million, or at a rate of 33.5%. Productive aging involves providing a safe and healthy work environment for workers of all ages.